For over 35 years, GlassWorks has been acknowledged all over the Chicagoland region as the industry leader in high quality, uniquely-crafted business oriented and residential glass products. Also you would probably like to know that GlassWorks has even been specified for being the quickest developing Midwest glass company thanks, in a big way, to our immensely focused team of sales specialists, project management team, our fabricators and hardworking installers – not to mention our loyal and outstanding customer base! As your one-stop-retailer for glass goods and alternatives, GlassWorks is the most desirable place for those individuals in-the-know when they are hunting for a distinctive glass tabletop, total glass table, or glass table base. It really doesn’t even matter what kind of distinctive glass tabletop, total glass table, or glass table base you are thinking about acquiring, GlassWorks has the history and realistic experience in being able to make your dream glass tabletop or glass table base of your wishes transpire! GlassWorks has been able to completely satisfy our customers with top-of-the-line winning services since 1997. We are skilled in particular with glass table customizing projects for example: glass end tables, glass dining tables, and glass coffee tables to our over 4,000 appreciated client’s specifications every year. Only lately, quite a lot of Highland Park customers have looked for GlassWorks’ know-how to help them figure out what would be the more acceptable glass tabletop for their certain dining room. Highland Park, Illinois is lovely, affluent village located about 26 miles northwest of the Chicago Loop. Highland Park is a suburban municipality in Lake County. Highland Park has a number of attractions which includes a vibrant downtown shopping district and the Ravinia Festival, the summer home of the Chicago Symphony Orchestra. There is a great deal of Highland Park locals and business owners who often seek the professional input and unique products from GlassWorks when they are in need of the finest-quality glass products found in the entire area, which is not too surprising. The GlassWorks professionals can create whatever shape or size of the glass tabletop our Highland Park customers need for their beautiful home or office. GlassWorks’ all glass tables will bring a brand new level of elegance to any of Highland Park family’s living rooms because they are unique works of art. Highland Park residents really like the fact that the experts at GlassWorks’ individualize a glass tabletop to help preserve a family heirloom table without needing to hide its beauty. 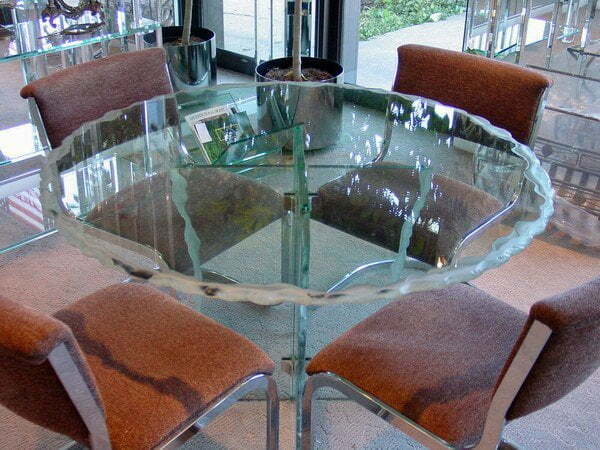 Highland Park homeowners have a greater appreciation for GlassWorks to be able to install a protective glass tabletop to help secure their table from any bothersome scratches or damage. Also, it will be able to even protect the table from the powerful and damaging grays of the sun and protect from any spilled liquids that can stain it too. GlassWorks is quite serious about protecting your tables with standard protection glass tabletops. We are even more serious about helping you save money! Our artistry and glass table items are known to be the greatest and most affordable in the Midwest. We are very mindful that one of the most important factors of selecting GlassWorks over the competitors really ends up coming to what the final price will be. That is definitely why GlassWorks will supply the most inexpensive glass table solutions to our valuable customers. Whether you want a one-of-a-kind range of glass end tables to go collectively with your beautiful new sofa set or even if you would really like us to design and style a mind-blowing glass dining table for your peaceful sun room, you can rely on us to take care of your demand as speedy as we can. We will even be able to deliver it just as quickly before you have any special celebration or even like an approaching anniversary. Merely just call us the moment you can at: 847.729.5580. You can chat with any of our friendly GlassWorks’ associates for your no liability, FREE ESTIMATE. They’ll also be sure to discuss with you about our guarantee for a year on each one of our glass products and installations, in collaboration with any manufacturer guarantee specifics that might be readily available too.